This image shows a little bit more progress on the front. The plywood has been completed, but the bump-out for the bedroom has yet to be started. That bay window off to the right was eventually removed and replaced with an eyebrow arch wood window. Another Craig's List find. Here's a close-up of the wood shingle roof. I loved this roof. It was one of the original fairy tale details that made we want to buy this house in the first place. Amazing that it lasted all these years--never a single leak. We had to remove this roof because we literally raised our roof and created a steeper pitch. There was no way to put these shingles back although we did actually consider that option. When our crew removed this roof, it turned out to be six layers thick! Who knew! They don't build roofs like this anymore. Again, Craig's List came to our rescue: We sold a good portion of the old shingles. We just couldn't see putting those beautifully patina'd pieces of wood into a landfill. I actually offered Anthropologie, one of my favorite stores, the shingles for free for an in-store art installation. But, we ended up selling them instead. 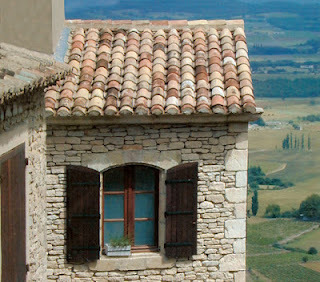 Here is our inspiration for our new roof. Provence barrel-style clay tiles. I just love this color palette. Sun-drenched, terra cotta with some mossy greens and merlots. We investigated acquiring these tiles, but unfortunately, they are too heavy. Building and Safety stipulates a lightweight tile. More inspiration for the colors we like for our new roof. Our exterior walls will be stone as well, so this image captured the nice textural element when combining the clay tiles and stone. We'll go with Vineto Fieldledge from Eldorado Stone because it's what we've used on our guesthouse and we'd like to stay consistent. It's made from cement, not actual stone, but it looks great and is easy to work with. It also has the salmon tones that I like. And it should match this tile color nicely. More inspiration. I actually printed out this photo so that we could try to duplicate the patina of this real authentic tile on our brand new "S" tiles from Boral. This is a sample of the reclaimed tiles we'll be using on our kitchen floor. We'll try to match this color palette on the roof. 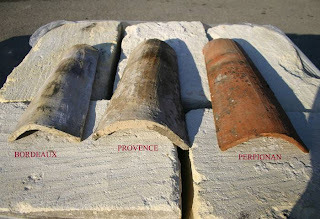 More vintage Provence tiles shipped all the way from France. We can't use these (they're too heavy), but we did buy a few—at $3 each—to help us match the color and patina. This image shows some of our color experimentation on our new "S" type Boral Claylight tiles in the corono del oro color palette. We'll also mix it up with the merlot color palette as well. That bucket is a nice mix of stucco (gray) and some cement and water. This is the real icing on the cake so to speak. 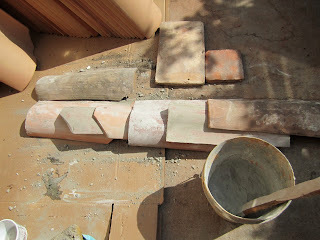 I used some of our "S" tiles that were broken to test out this slurry. We picked up quite a few tiles from another Craig's List poster. They were $1 each, which is half the price of the cheapest retail roofing supply store in Los Angeles, so it was worth the effort to drive out to Burbank and pick them up. Of course, when buying tiles new, you also have to consider the transportation fee, which is pretty steep for tiles. The guy at the roofing supply store wasn't a big fan of our idea to slurry up our tiles. He thought the grout or cement would wash off. But, we're willing to experiment. Unfortunately, new tiles just don't have that old world patina and may take many years to develop it. Here's a shot of our new roof tiles going up above the bedroom wing. Woah! 6 layers thick? No wonder it looked so strong and well-built. :) Also, wooden shingles provide a natural insulation and even though it is lightweight, it is still capable of withstanding strong and erratic weather conditions. 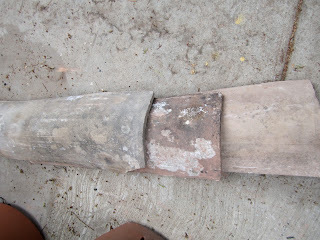 “When our crew removed this roof, it turned out to be six layers thick! Who knew! They don't build roofs like this anymore.” Well, that explains why it has served the house right without any problems. It goes to show that good quality does equate to a long-lasting service. 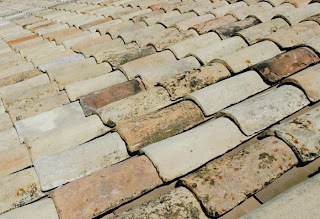 Anyway, your new tiles for your roof look really authentic. 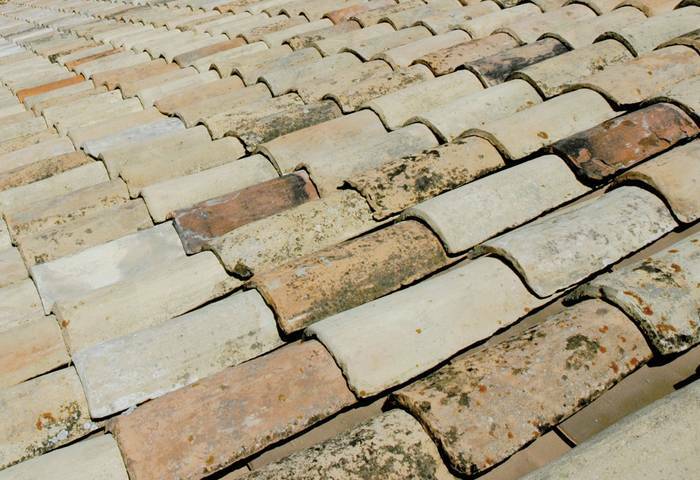 Be sure to perform regular roof maintenance to sustain its good condition. Are there any updates? One good thing about clay tiles is that they have great insulating properties. They reflect the heat from the sun, instead of absorbing it. Consequently, they can lessen the energy needed to maintain a comfortable temperature inside your home. 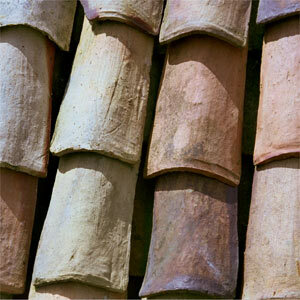 Wise decision in choosing clay tiles for your roof! 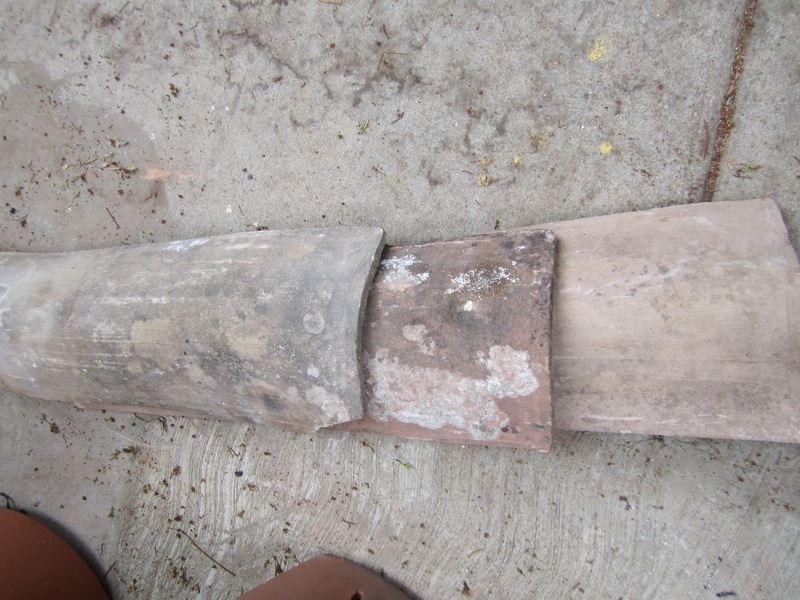 Did you know that they are acceptable for restoration for a wide range of historic houses? It’s actually a slightly popular choice for restoring large, old houses that were built with exceptionally sturdy structural support. Your house reminds me of Bilbo Baggins’ house from The Lord of the Rings, largely because of the trees surrounding it. Ever thought of having those trees trimmed down? You see, they can be dangerous during extreme weather. The clay shingles may be tough, but they can easily knock down your house with their weight.